Being skeptical or a skeptic in a nutshell means the person requires proof or facts about a given subject before they can believe. Matrixing is one of those areas that allows a skeptic to be presented with a fact normally in the form of a picture that may present evidence, but still allow the skeptic to push it off as a mind trick or mindplay. Matrixing is basically the brains ability to create a familliar image or sound from a picture or audio file that would otherwise be unrecognizable. Faces are probably the most common form of matrixing. The best matrixing or mindplay I have come accross so far is the picture to the left. 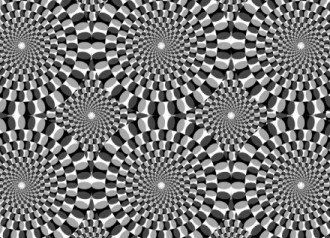 This is truly a marvle and can show how the eyes and the brain can be tricked into seeing something which is not reality, in this case the image appears to be moving, when in fact it is stationary. The first time I saw this image, I did not believe that it wasn't moving and that it was an animated image, but it is not. The patterns at which this image is constructed plays a trick on the eyes. If you look at it in different places, you can stop it from appearing to move in others, but for the most part, it always looks like its moving. If you still can't believe its not moving, print it out!! Matrixing can show in many different forms ,but the most popular would probably be a face of some sort. One of the most famouse faces to appear in many different places is the the face of the virgin Mary. 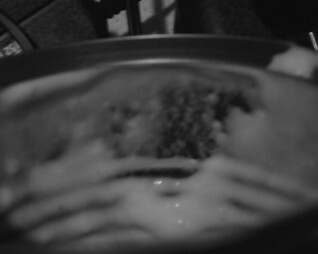 How does one explain the sudden appearance of a face in everyday products such as bread, or in my case a clam chowder can!! The picture to the right was not an attempt at matrixing, but merely the place where a piece of cut potato was stuck to the side of the can. This is the first time I have come accross this phenomenon myself and I did not see it till I was not looking at it directly. Some people might not be able to see this at first glance, and others will pick it right up. Is this an attempted contact from a passed relative or just being in the right place at the right time to see a pattern in a bunch of clam chowder goop?? 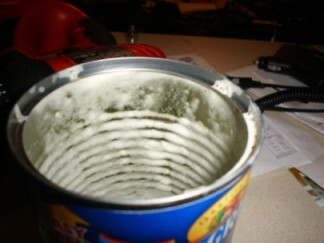 Here is another pic of the can a little closer with a little less clutter around it. If you could not see it before, then you probably can now. I am not really sure what to make of this phenomenon, but if I traced my family tree back far enough, I am willing to bet I could find someone who resembles the goop in this can. I am still on the fence on what to make of this phenomenon, its one of those mysteries that I still think is just left to chance at this point. EVP can present itself in much the same way. If you tune to a blank spot on a radio and listen long enough, your brain will sooner or later start picking up on patterns in the static that may sound like voices or spoken phrases. The following link will download a small wav file which was created with my sound program. Its basically static witch has been run through a filter causing instabilities in the static pattern. If you listen closely, you may hear voices or even a phrase or two which are not really there! If you listen to the above file enough times, you will most likely hear something. Because this was not recorded and in fact created, it is not possible at least in my opinion that this could be a genuine EVP. I will leave it to your imagination as to what it could possibly say.